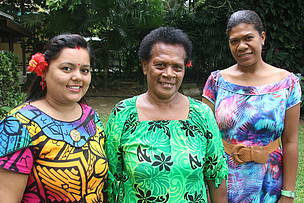 WWF-Pacific admin staff, Artika (Left) and Akata (Right) with Lo (Center) pose for a picture. It is very rare when you get to meet colleagues in a work place who leave a lasting impression on you and later become regarded as family. Kasanita Logamosi affectionately known to everyone at WWF-Pacific as Lo is that one unique individual. 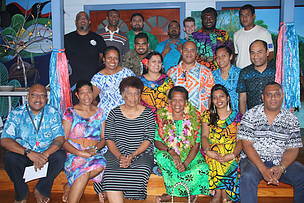 Lo is the longest serving staff here at WWF-Pacific. 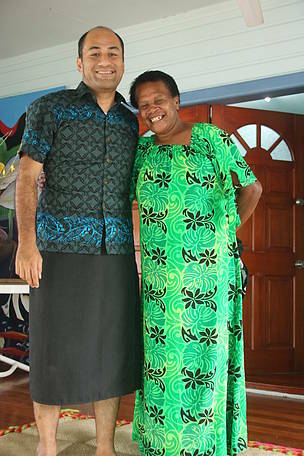 She has been with the organization since 1995, the start of a WWF office in Fiji. This year, marks her 23rd year of unbroken service and Lo has decided to call it a day. Lo is part of WWF-Pacific’s Fiji Office Administration team and has over the last two decades ensured the organization’s every corner working space (each department’s desk space, conference rooms, kitchens and restrooms) are clean hygienic, safe and conducive for staff to work in. A very demanding job she has perfected and taken pride in over the last 23 years. The Nakorovou, tikina Nalawa, Ra native’s meekness and dedication to her work is just as important as any other WWF-Pacific staff. For Lo, being employed at WWF-Pacific for 23 years is something she will always be thankful for. “But mostly, I am grateful for the employment opportunity as being a single parent I was able to support my two kids, eight grandkids and family back in Nakorovou. I am also lucky to find a good place to work for and this is something I will cherish as well,” Lo added. 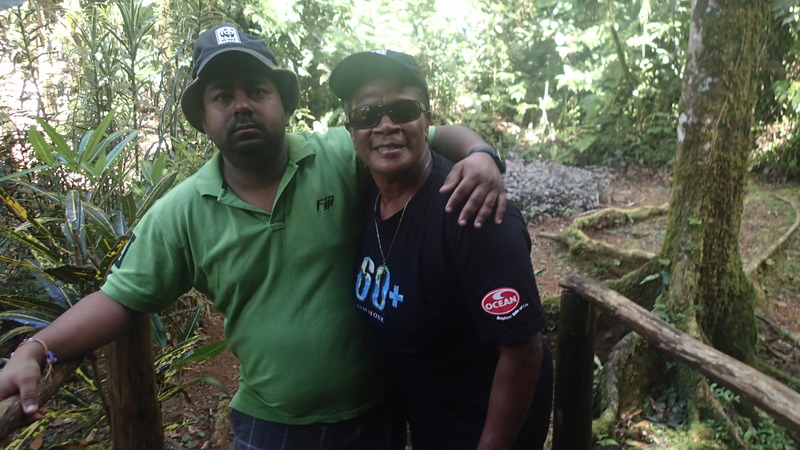 For current WWF-Pacific Fiji Office staff, Lo has been much more than a work colleague. “She has been a mother figure to all of us. She is the corner stone for her family and with that she has provided us her with advice on health issues. For Lo, you didn’t have to tell her what to do. She knew what to do. She will be missed but her retiring will give her the chance to spend more time with her children and grandchildren,” highlighted WWF-Pacific’s Human Resources Manager, Kathryn King. “I have known her for over ten years. She is hard working and honest. She also has a humorous side to her and always says what she thinks straight out and at times it can be funny but that is Lo. 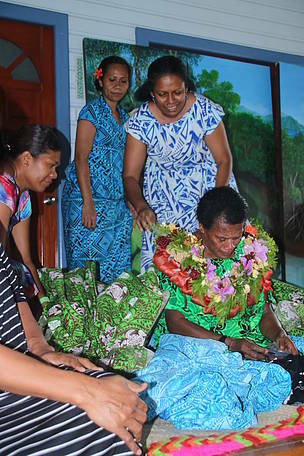 I wish her the best and may the good Lord bless her and her future endeavors,” said WWF-Pacific’s Administration staff member, Frederick Cassidy. “She is a very friendly person. Always there to provide support in whatever way she can. I can recall one time, my daughter was sick and Lo was there to give advice on herbal remedies. That is the person she is. She is always there to help whenever she can. I will surely miss her. 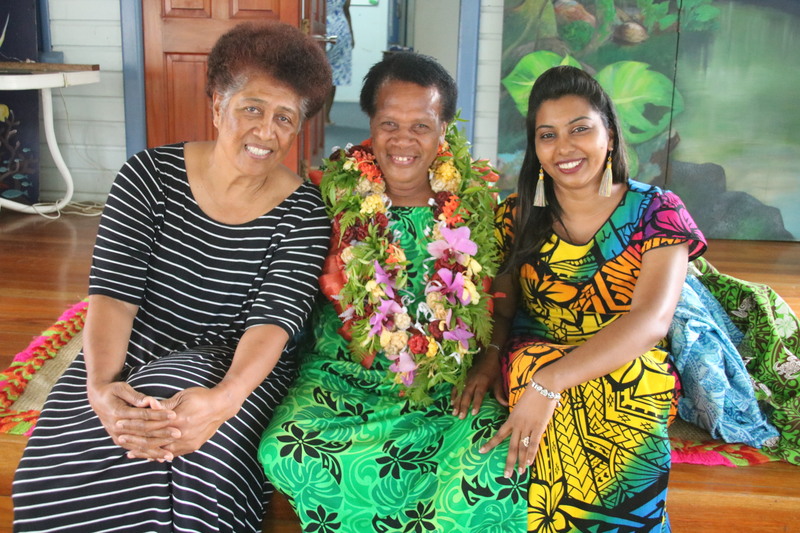 And I want to wish her the very best for whatever she has planned for the future,” added WWF-Pacific Administration staff member, Akata Kikau. "I have known Lo for seven years and have been her Supervisor for the past three years. She is a very hardworking, dedicated and a valued employee of this organization. We have created and shared best memories and I wish her well for future endeavors. Vinaka Lo for committing 23 years of your life to WWF-Pacific,” added WWF-Pacific’s Administration Officer, Artika Singh. “I have been working here for six years. First time I met her she had explained she was one of the oldest serving employees here. One thing I have noticed is that she is one hard working person and is also a single mother. For me, to know what she went through and how she works to try and support her family by herself, it encourages me as a man, in a sense that if a woman can raise a family and do so much in raising her children and providing for them, we men cannot make excuses,” highlighted Administration staff member, Waisea Namotu. “Nine years I have worked with Lo. She has that motherly unique way of helping people. She is good at giving advice. She doesn’t earn that much but every money she receives she tries to help her family. When it comes to family, she is really the backbone for her family and that shows a lot about her. 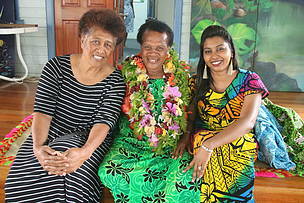 I wish her all the best,” added WWF-Pacific’s Graphic Artist, Kalo Williams. In the New Year, Lo plans to open a market stall at the new Laqere market by venturing into her dream of running her own business selling root crops and leafy vegetables and fruits from her province of Ra. She intends to also spend quality time with her family. All the best Nau Lo. Nau Lo with WWF-Pacific Conservation Director, Francis Areki at her recent farewell party hosted by WWF-Pacific Fiji Office staff. WWF-Pacific ladies showing the organizations appreciation to Nau Lo for the years of service rendered towards WWF-Pacific. Group photo of WWF-Pacific Fiji Office staff with Nau Lo at her farewell ceremony. (L-R) WWF-Pacific Representative, Kesaia Tabunakawai, Nau Lo, WWF-Pacific's Finance Manager, Raziya Saiyed. 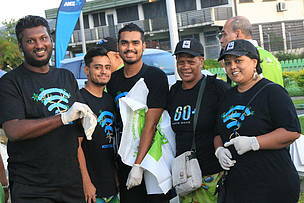 Lo (Second from the Right) with WWF-Pacific colleagues that were part of this year's Earth Hour. Lo with fellow WWF-Pacific colleague and IT Officer, Alvin Kumar, who were part of a Day Away trip.